I’m baaack! Did you miss me? I feel like it’s been way too long since I made a post. I was going to blog about our trip to Cabo San Lucas but I may not. You guys let me know if you’re interested in that or not. It was so fun and we had a great return experience bringing Liam but I already posted pictures on Facebook and Instagram. I don’t want to over share if you know what I mean…? So, go get some lemons, get your aprons on and let’s bake! Preheat oven to 350 degrees fahrenheit. First make the crumb topping. In a large bowl, whisk together the flour, brown sugar, salt and zest. With your hands or a pastry blender, cut in the butter until the mixture resembles coarse sand. Place the bowl in the fridge while you make the cake batter. In a medium bowl, whisk together the flour, baking soda, baking powder and salt. Set aside. In another large bowl, beat butter and sugar until smooth and creamy. Add in eggs, lemon juice and zest and beat until combined. Fold in the sour cream with a spatula until combined. Fold in the dry ingredients until just combined. Pour into your prepared bake dish. Take the crumb topping out of the fridge and evenly sprinkle it over the cake, breaking up any large pieces. Bake for about 40-45 minutes. Allow to cool completely on a wire rack before making the glaze. Once cake is completely cooled, stir together powdered sugar and lemon juice in a small bowl until you reach a drizzly consistency. Drizzle over the cake with a spoon. Or Zebra Cake as my son and I call it. I got a recipe card for this in our last Hello Fresh delivery and of course I had to try it. Only 2 ingredients?! Come on! So easy, and a no bake dessert at that. Awesome! 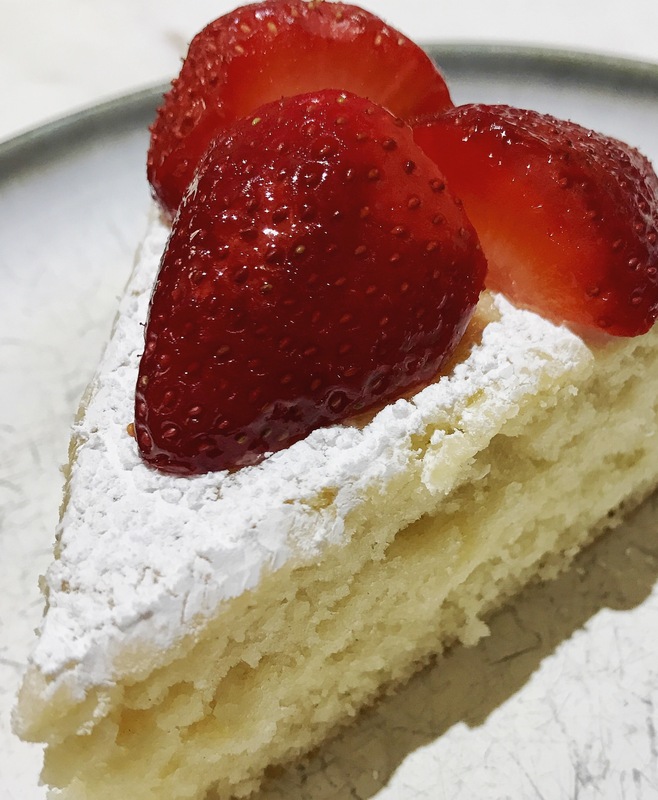 Back to this cake… it really is so delicious and so easy to make but also very filling! I made my own whipped cream which is way better than Cool Whip in my opinion. And that’s also so easy. I will share the recipe in this blog post. So, before going in there are 2 things you need to know: first is that it needs to be refrigerated for at least 8 hours or overnight before serving. A great dessert to make the day before. Second is that you need a springform pan. So before attempting this recipe, make sure you have time and the correct pan. To make your own whipped cream, in a cold metal (or glass) bowl, whisk all first 3 ingredients until stiff peaks form. It took me literally 5 or 6 minutes, my arm was hurting! It takes a while but it’s so worth it. Once your whipped cream is made, evenly spread 1/2 cup on the bottom of the pan. Next, evenly place the wafer cookies on top of the whipped cream layer. 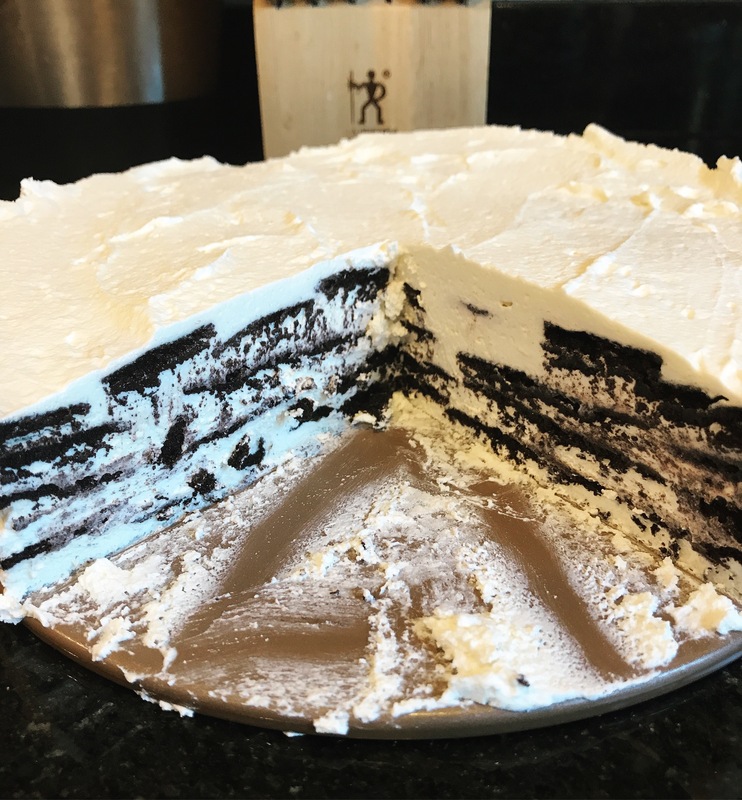 Continue making layers like this making sure you end with whipped cream. I did 4 layers of cookies but could have probably done another one. Cover with plastic wrap and refrigerate for at least 8 hours. Tip: Feel free to break cookies the fill in any gaps. When ready to serve, carefully remove sides of pan. Use a warm knife to cut and rinse off after every slice for smooth edges. Enjoy!